Philosopher's Pie at Mellow Mushroom - olive oil & garlic base, grilled steak, artichokes, olives, Portobello mushrooms, feta, provolone and mozzarella. 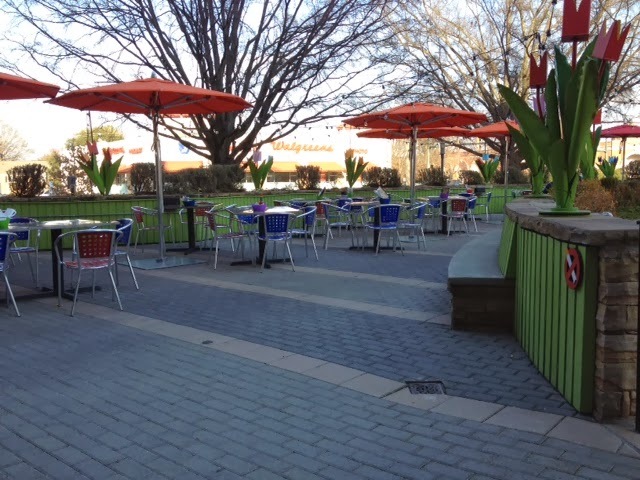 I recently had the opportunity to try the newest Charlotte location of the Mellow Mushroom - uptown near the new Knights baseball stadium and Romare Bearden Park. The space is airy and modern with a long bar on one side as well as booths and tables. There is also patio seating. My family really enjoyed our experienced and we sampled quite a few different items. My favorite thing by far was the Maui Wowie pizza (below) - definitely some strong flavors going on with it, which I love - especially the banana peppers and jerk chicken! The bruschetta and wings were excellent, as always, and our little one enjoyed the kids mac & cheese as well. To top things off we tried several of the freshly baked cookies - delicious. 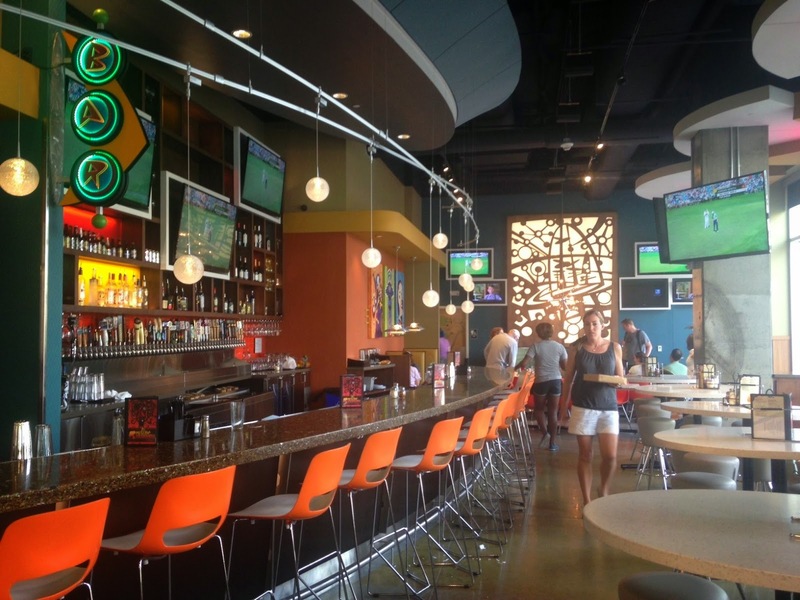 Mellow Mushroom is a wonderful addition to the uptown dining scene. They have a full bar and are open LATE too - until 11 PM Sunday - Wednesday, until midnight Thursday and until 3 AM Friday and Saturday. Definitely a great place to keep in mind for a late night snack! Maui Wowie Pizza - now my personal favorite! Pesto base with ham, pineapple, jerk chicken, banana peppers, smoked bacon and mozzarella - yum!! Bruschetta - I could not resist ordering this even though I have had it before! Love the basamic glaze. BBQ wings - very good! Kids mac & cheese with broccoli - the little guy loved it. Can you tell who is behind the water wall?! After lunch we spent time at the new Romare Bearden Park adjacent to the new baseball stadium. It has some neat features including this waterfall that kids can play under and a fabulous view of the skyline! Disclosure: The meal described in this review was complimentary. New Eclair Selection. From L to R: classic (vanilla custard) with Ritz chocolate topper, S'mores with chocolate custard, pistachio strawberry, raspberry rose and caramel. I was very excited to be invited to a special dessert tasting featuring the delicious sweets offered at Bar Cocoa at the Ritz-Carlton in uptown Charlotte. Bar Cocoa is the only one of its kind in the world and its corner location (Trade and College) allows both hotel guests and uptown Charlotte pedestrians to partake of pastries, gelato, coffee, chocolates and other goodies. Cooking classes, catering and custom cakes are also offered and there is even a champagne and chocolate all dessert dinner option on the weekends! The French macaron selection is truly impressive. New flavor blueberry lavender has a subtle lavender aftertaste with strong blueberry notes. Other favorites include coconut, red velvet, honey, dulce de leche, and caramel but there are at least 10 macaroon options to try on a daily basis. 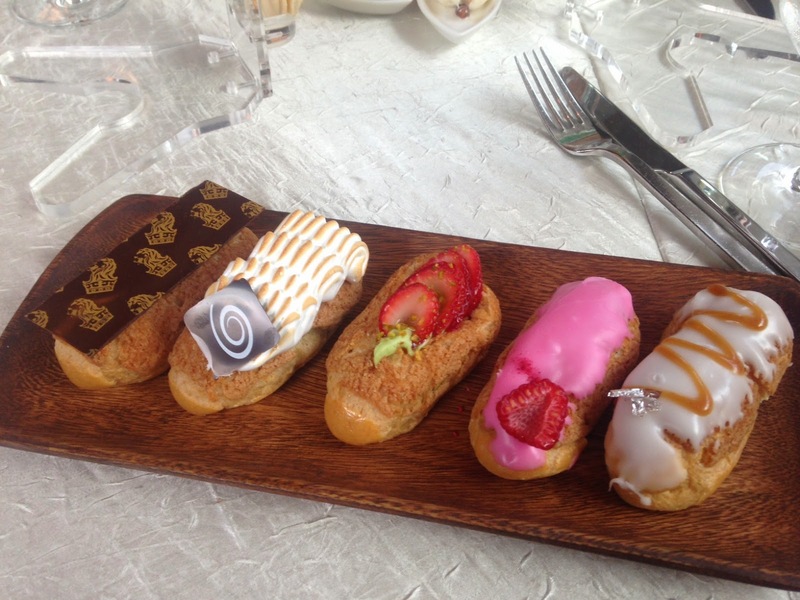 The new eclairs are incredible - my favorite item we tried. The outside of the eclair is crisp and a little crunchy, giving way to smooth fillings - nothing at all like the soggy eclairs typically found in grocery stores. My favorite flavors were the classic and the caramel but all of them were truly excellent. 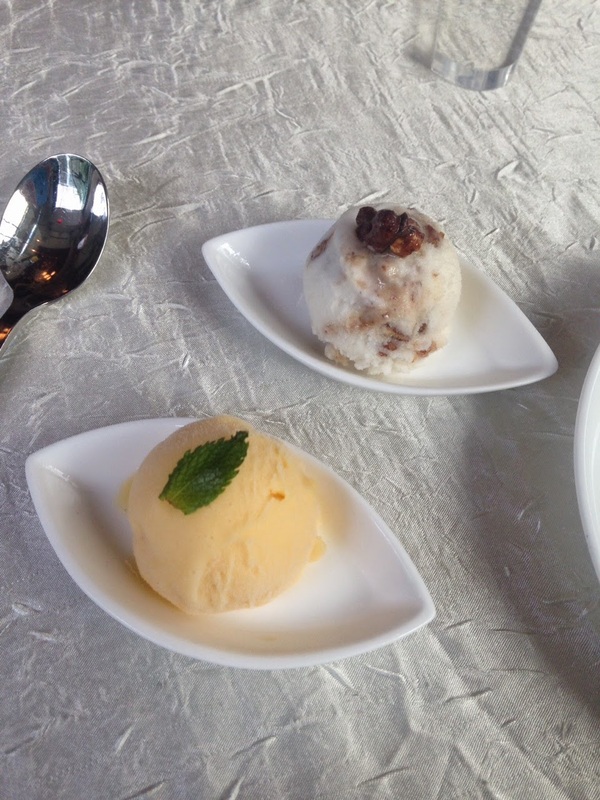 Gelato: Peach Mango and Honey Pecan. The new peach mango gelato is terrific for summer - flavorful, creamy and refreshing all at the same time. On Friday and Saturday afternoons you can sample the gelatos in tiny cones in the Ritz's lobby - this will cause you to dash back to Bar Cocoa for a larger serving! The Ritz-Carlton cake - dark chocolate, candied orange and Grand Marnier. 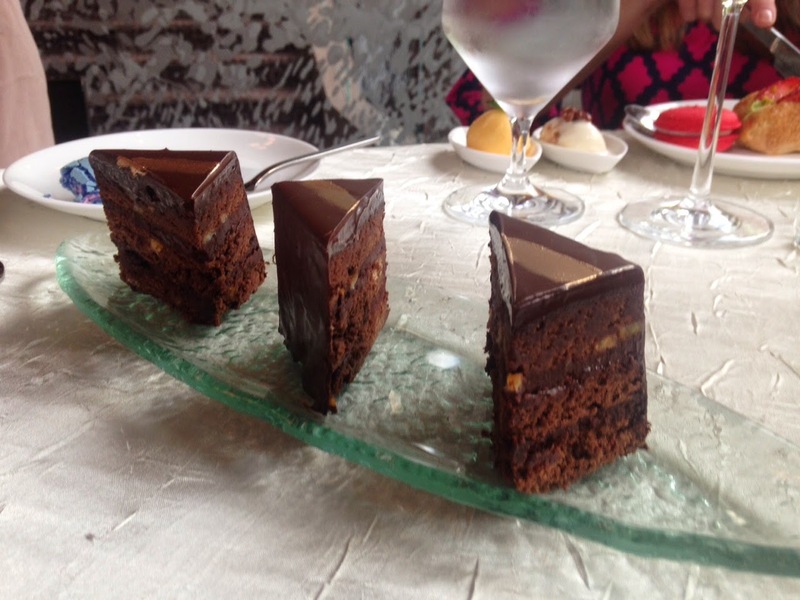 This rich, chocolatey cake is available at every Ritz all over the world. But remember, no other Ritz has a Bar Cocoa! 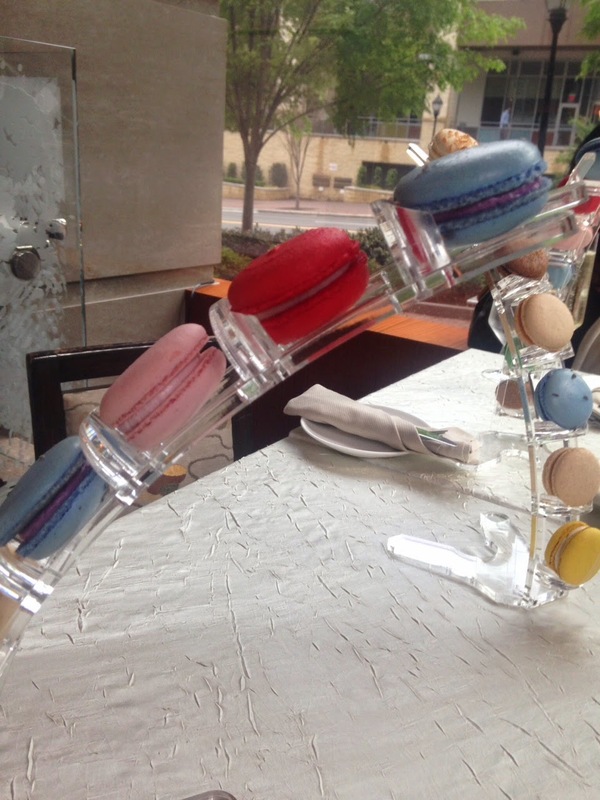 Lovely table decoration made from many flavors of macaron. Milkshakes - we tried mini versions but these are sold in standard larger sizes - from L to R - chocolate hazelnut, banana caramel and cookies and cream. My favorite = cookies and cream! 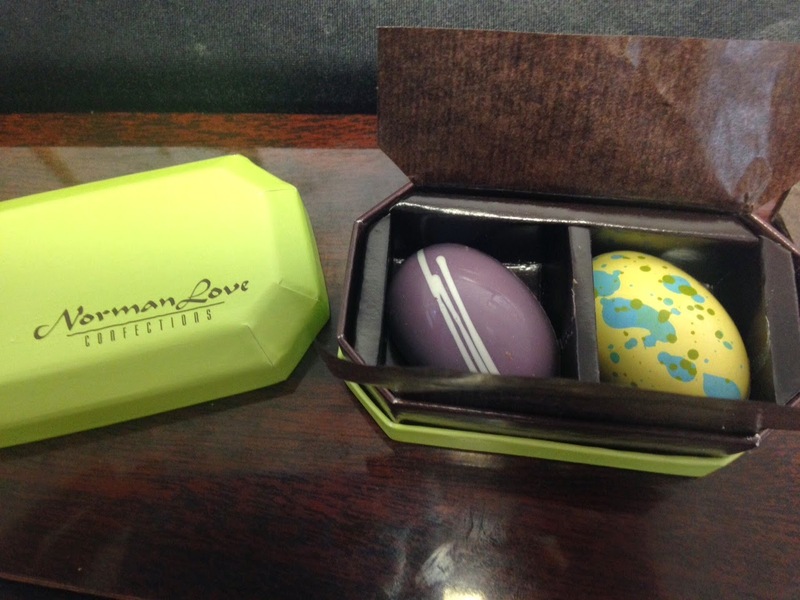 Norman Love Easter Collection selections. These are peanut butter and lemon - delicious and beautiful. See the entire Easter collection here. The chocolates are the only item that is not made in-house at Bar Cocoa. If you have not yet tried Bar Cocoa, I recommend it for a sweet treat anytime! Since it is located in the Ritz-Carlton, it is even open until midnight on Friday and Saturday - sweet! 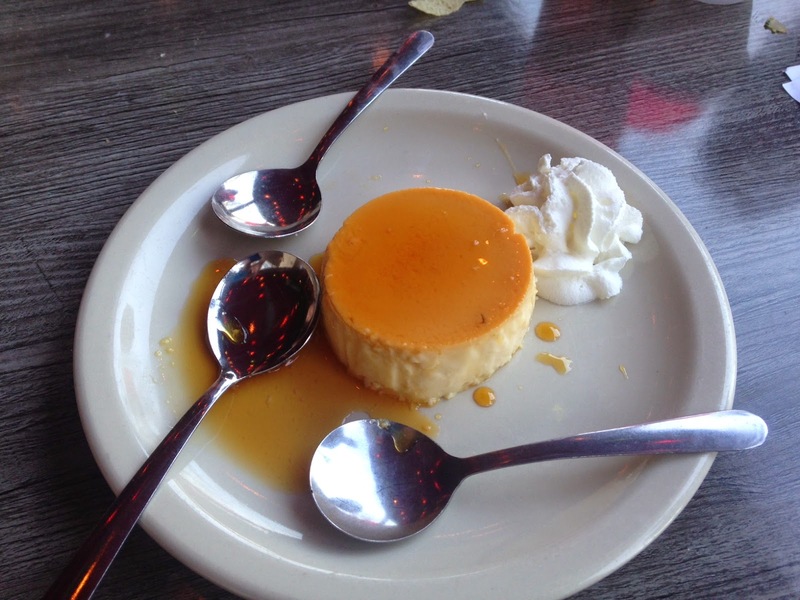 Disclosure: The desserts described in this review were complimentary. 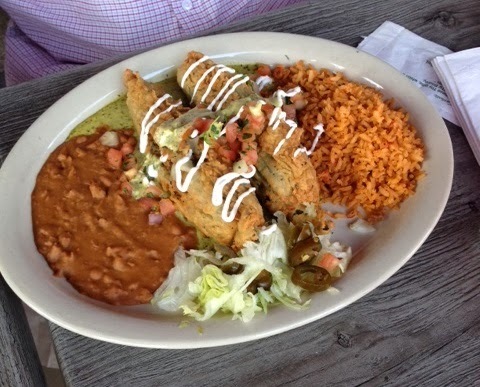 Chile Rellenos stuffed with Shrimp and Cheese. 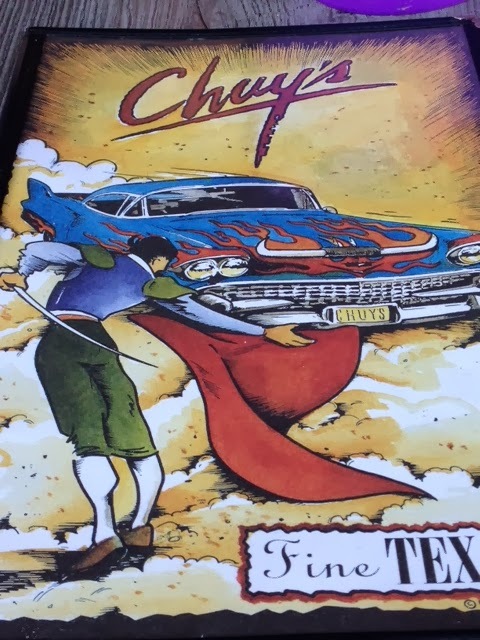 Chuy's is a Tex Mex chain with a huge following with its first store in Austin, Texas circa 1982. The Charlotte outlet opened summer 2013 and I recently had the chance to try it out. I had never been to another Chuy's before and I really enjoyed my first experience. 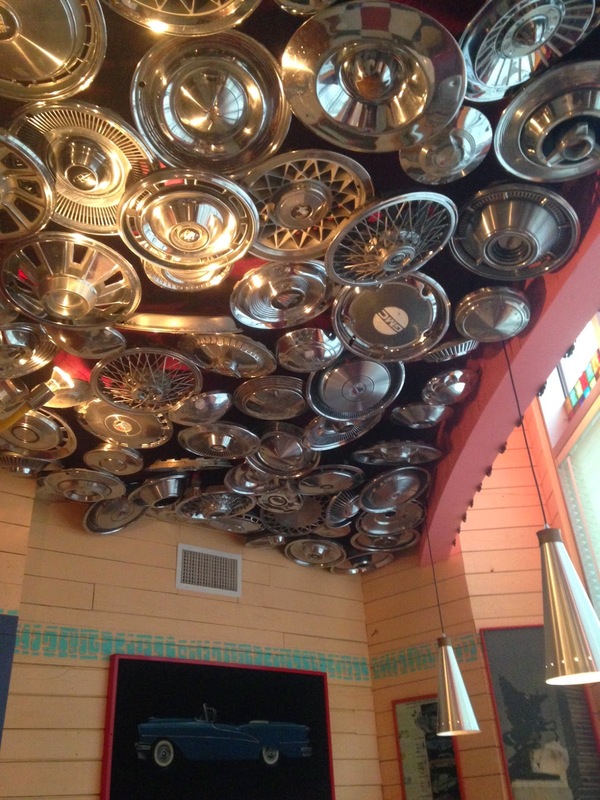 Much of what makes Chuy's fun and unique is the atmosphere, including several kitschy / themed rooms like the palm tree room and the hub cap room. We ended up sitting outside which was a great choice since my son was with us. He was able to run around and play near the fountain, which is just outside the patio seating area. The inside is great for kids as well - in addition to the interesting decor, there is a tortilla making area where kids can watch and make their own. 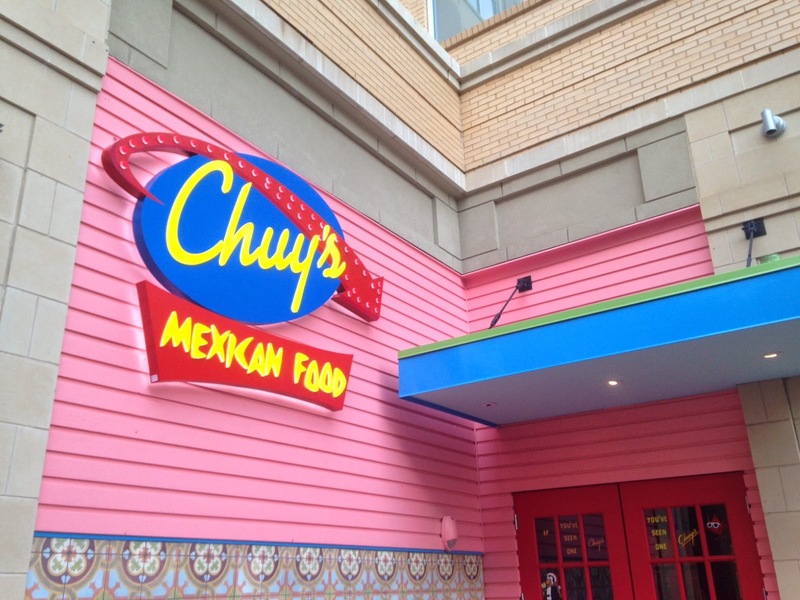 Previously, Charlotte lacked a Tex-Mex presence so it is great to see Chuy's filling this niche. The menu is huge and includes several specialties that you don't see often - like Elvis Green Chile Fried Chicken. 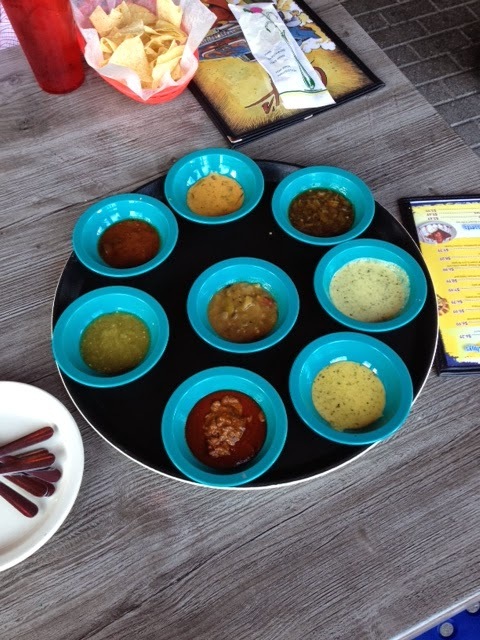 We tasted all the sauces - and there are LOTS - see photo below. My favorite was the hatch chile sauce - delicious and you would be remiss not to try the boom-boom sauce on something! 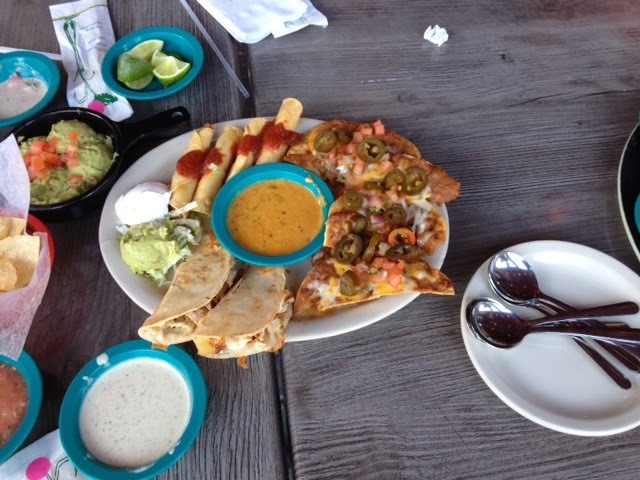 The appetizer platter was a crowd pleaser as well, especially the loaded nachos and the chicken flautas. 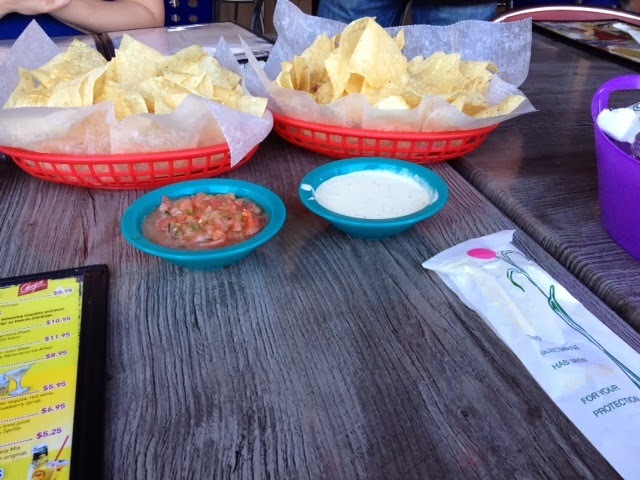 I liked the thin chips and salsa - allowed me to eat more of them and taste all the sauces! 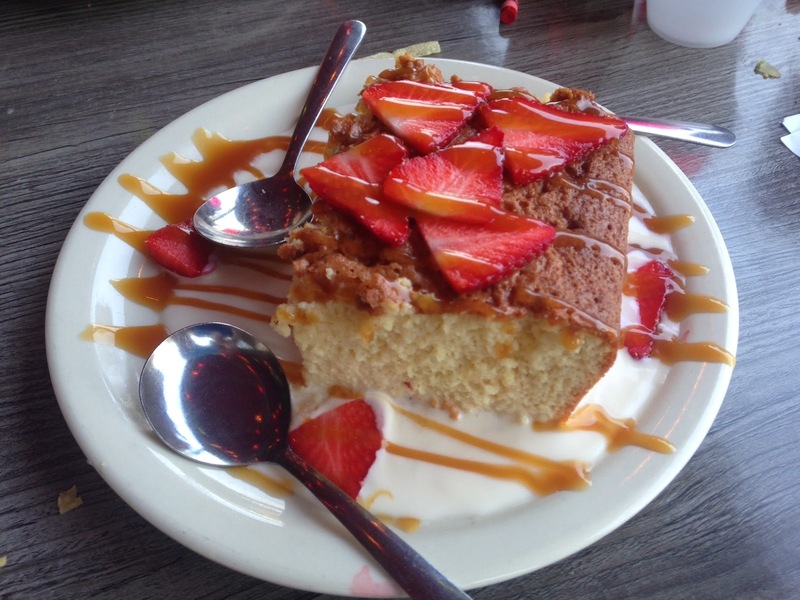 My other favorites from the meal include the chile rellenos - we tried the one stuffed with shrimp and cheese but there are several options and the sinfully rich and delicious tres leches cake - one of my favorites anyway - this version really took the cake!! 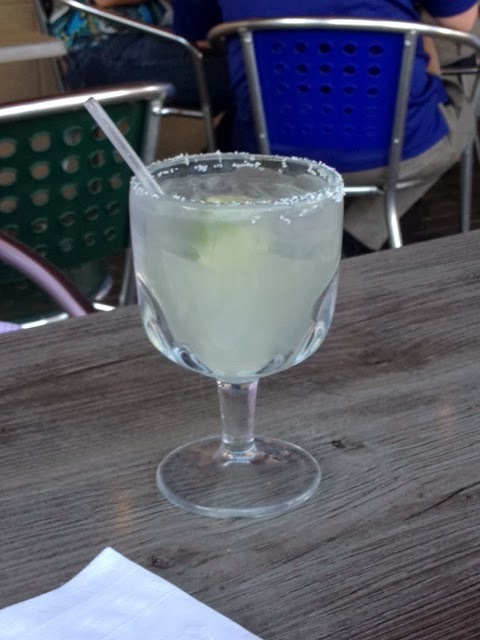 There is a full drink menu available including specialty margaritas which my adult dining companions thoroughly enjoyed. 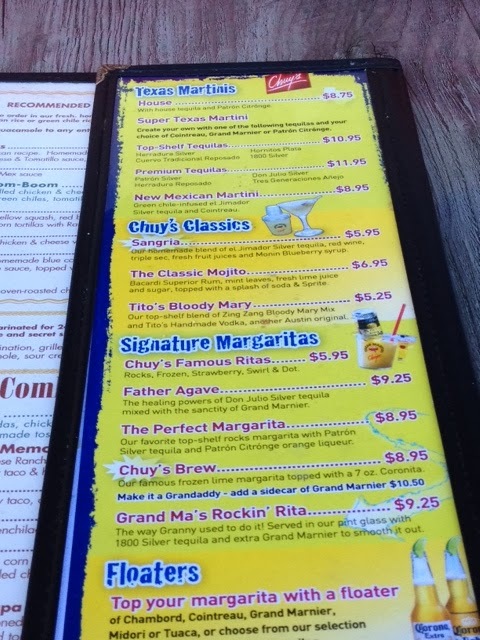 If you have not yet tried Chuy's I encourage you to check it out - it is located at the corner of Sharon and Morrison, convenient to all your South Park shopping needs. Credit for almost all the photos goes to my awesome cousin, Benjamin Leder. Appetizer platter - loved this! 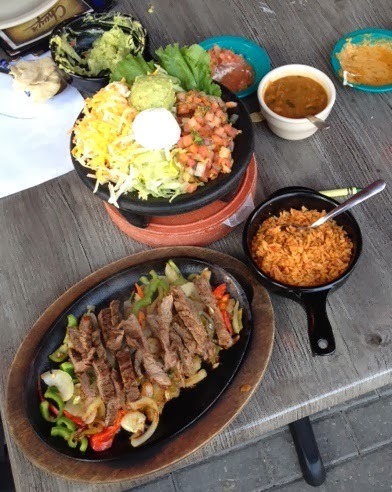 Steak fajitas with all the fixins! 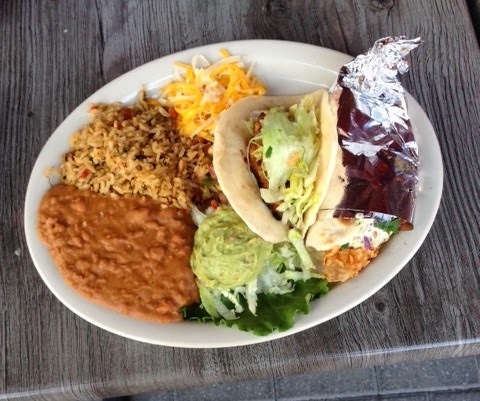 Taco platter - fish and chicken. Tres Leches - one of the best I've ever had. The Tagliatella signature pizza with eggplant. I have been meaning to blog about La Tagliatella for quite some time so I am glad I am finally able to post about this relatively new Italian option in Charlotte. La Tagliatella is a chain restaurant, but unlike most that we know, most of its locations are in Spain with only 6 locations in the US. The Charlotte location opened early last fall and we enjoyed a friends and family night and media night. A few weeks later, we took my mom for a special birthday dinner and had a very enjoyable meal. The above pizza, actually called the Tagliatella, is one of my favorite menu items - how could it not be delicious with fried eggplant and drizzled with honey and balsamico glaze? We also really enjoyed the Caesar salad and several pastas - I can't recall exactly what is in every photo but we did enjoy everything. For dessert, try the bocconcino - a cheesecake topped with delicious custard. There is a lot to choose from and the dining room has a neat, unique European feel. There is a special lunch menu, kids menu and bar menu and regular specials including some great specials in March - see the website for details. I encourage you to try La Tagliatella if you are uptown - it is definitely a great option at Epicentre. Caesar Salad - very good! Pasta with red sauce and meatballs. There are a variety of handmade pastas including several stuffed pasta options. Garlic Shrimp with Ravioli - much of the pasta is made in house. Another tasty pizza - you fold it over so you taste all the components. Desserts including the special cheesecake (right) - one of my favorite cheesecake renditions ever! 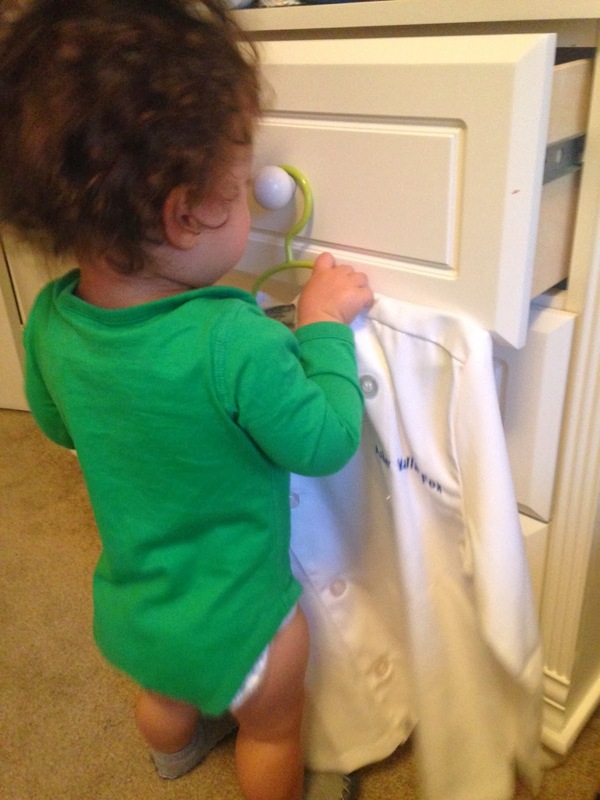 I recently had the opportunity to receive an adorable monogrammed mini-chef coat for my son from The Chef's Emporium. Although he is not quite big enough to use it yet - this XS size is designed for ages 3-5 years - I cannot wait until it fits and he is old enough to help me even more in the kitchen! Sizes for ages 3 - 10 years are available. I know he will be absolutely thrilled to wear it and help stir the soup, break eggs, use cookie cutters and mix in chocolate chips (among other things) while wearing this professional-looking outfit! He already likes to pretend to help! The kids chef jacket is available in white, blue, red, pink and lime green and as you can see, monogramming is available. Can you think of a cuter gift for the foodie-in-training or even as a baby shower gift for parents who love to cook? What a unique gift! Check back for an update in a year or two when he is actually using this jacket and helping prepare meals and treats with me! Pulled Pork Platter with sweet potato casserole, marinated slaw and green beans with Texas toast. Moe's Original BBQ has locations - they call them "joints" - in 9 states, with the majority of the restaurants located in Alabama. I was invited to try the location closest to me (Matthews, NC) last fall. 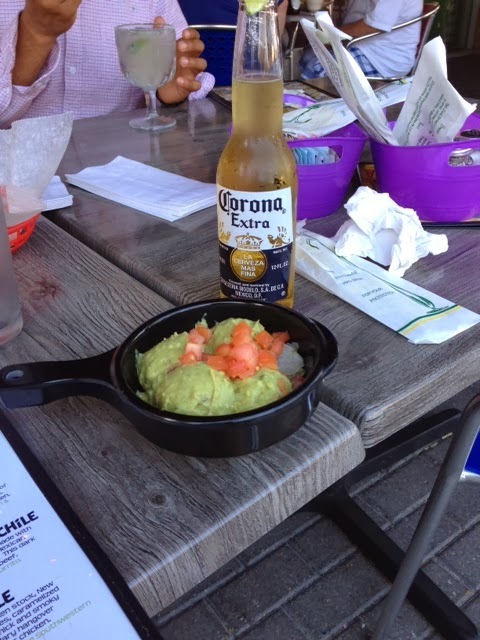 While I am not in the Matthews area often, we were thoroughly impressed by Moe's and enjoyed every bite. I wish they would open another Charlotte location closer to uptown - maybe this is a possibility?! Everything we tried was truly delicious. I also like the fact that Moe's has special side dishes each day, so there is always something different to try in addition to the regular tasty sides that they have. We tried both the pulled pork and the ribs and we also had a few wings. The pulled pork was great and the ribs were extraordinary. My favorite sides include the sweet potato casserole and the marinated slaw. Even my son who wasn't quite 1 year old at the time, loved it and ate the BBQ and the green beans. In addition to the regular menu, which includes smoked turkey, smoked chicken, a salad and even a smoked tofu sandwich in addition to the pork and ribs, there are daily specials and brisket is featured on a weekly basis. You can check out Moe's Original BBQ Facebook page for more information on the daily specials. Even vegetarians would be happy here with either the tofu sandwich or a veggie platter since there are so many sides to choose from. Some recent side specials include cornbread dressing, squash casserole, roasted brussels sprouts and Mississippi mud pie - yes desserts count as sides! There are also party packs available for small or large groups and catering is offered as well. Click here to see the Events Calendar for the Matthews location - there is a kids eat free night as well as other special events listed. 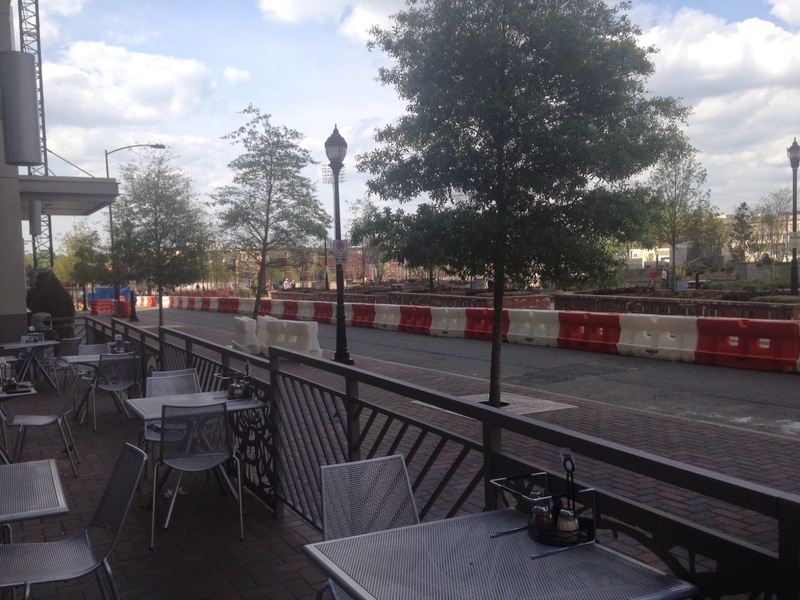 This photo, taken the same day we ate at Moe's back in October, demonstrates how long I took to get this post up. I promise I will try to be a better blogger!! 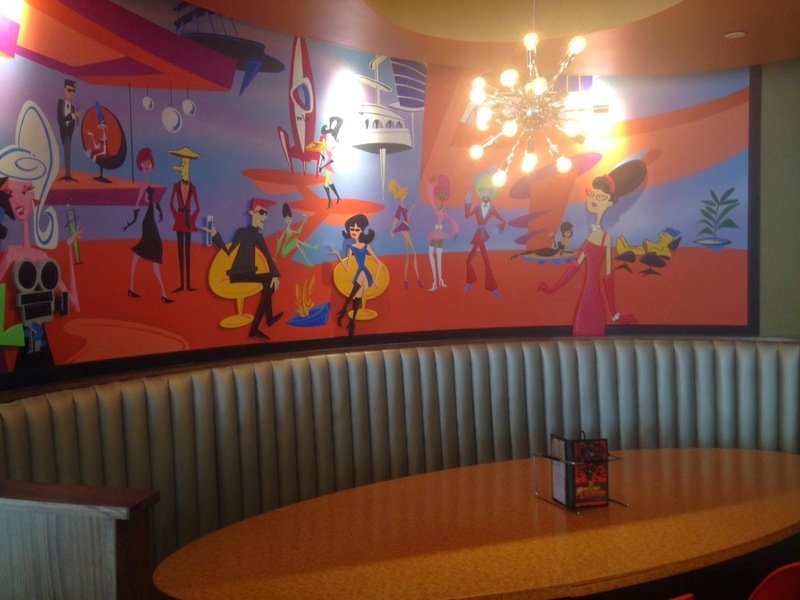 Moe's Original BBQ features indoor and outdoor seating. Ribs platter with banana pudding and cabbage. Yes, you can get banana pudding as a side dish! YES! The ribs were fantastic - tender and juicy. Next time I am in Matthews I will definitely seek out Moe's again, but in the mean time I will be hoping to hear about a location closer to home!